This bowl of veggies speaks to my seasonal confusion. Warm brussies at the bottom, watermelon radishes chilling on the top with roots, macadamia nuts and toasted coconut. It’s some sort of a fall meets spring culinary mullet. Business on the bottom, party on the top. But, I’m not complaining. If I have to stare at a mullet of any kind, I choose this one. Or, one of my Dad’s headshots from the 80’s. He had a glorious and naturally curly mullet. The photo is in black and white, with a soft glow emanating off of his ringlets. It’s really something. So, I should change my statement and say that if I have to stare at a brightly colored metaphorical mullet, it would be this salad. You know, since my preferred black and white mullet slot is already taken. I like to clear these things up. They feel important. Speaking of mullets, and fashion statements of yore… can we just take a minute to talk about how crop tops are happening again? It’s a frightening thing to happen in ones 30’s… especially if your abdomen is not exactly looking like it wants to be cropped or topped. It’s even more frightening since I’ve already participated in this fashion trend. We did this in the 90’s. I worked my way through the Delia’s catalog. I dressed like a cast member on Dawson’s Creek. I think I even wore a belly chain once or twice (I don’t want to talk about it). So, it’s confusing to me when I drive by a local high school and the kids seem to be raiding my teenage closet. Am I old enough for this to happen? Trends are repeating on me. I did buy a pair of really light, high-waisted jeans this weekend, so I’m probably part of the problem. Sorry in advance. Let’s just eat some salad and try to forget about the whole thing. Crop-tops are totally optional. Do what you need to do. I’m just going to be over here stuffing my face and putting watermelon radish on everything. 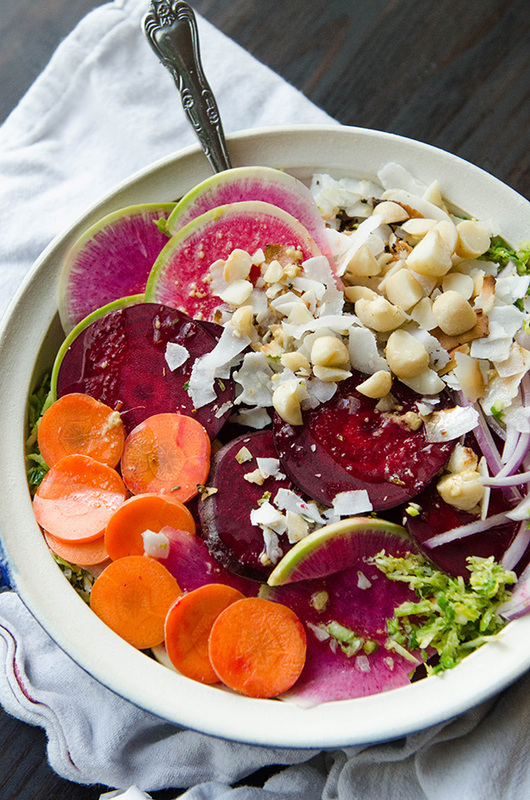 If this salad was an outfit from 1996, the watermelon radish would be the belly chain. It brings the bling. Ties the whole thing together. Flashy. 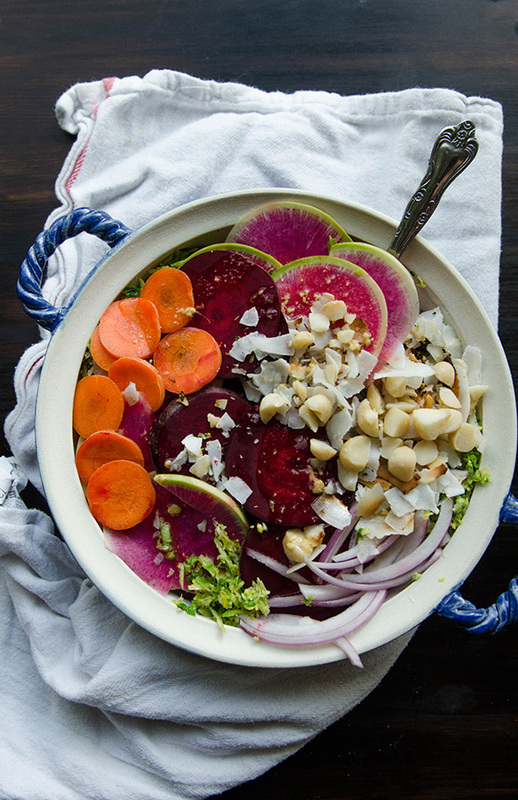 Seasonally, this bowl of food is kind of all over the place (much like this post). But, somehow it makes sense (unlike this post). Cover it all with a bright and tangy orange and dijon dressing and then try to be mad at it. You can’t. Unless you can. Because, feelings. Either way, I hope we can still hang out. Cool. Preheat the oven to 450 degrees. Line a baking sheet with aluminum foil and set aside. Shred your bussels sprout in a food processor, using the grater attachment. Place them in a mixing bowl with the pressed garlic and the melted coconut oil. Toss until all the sprouts are coated with coconut oil. Add salt and pepper to taste. Pour the coated sprouts onto the lined baking sheet and allow the sprout to roast for 15-20 minutes, checking on them and tossing them every 5 minutes. Once the sprouts have softened and are lightly crispy, they are done and you can remove them from the oven. While your sprouts cool slightly, make up your dressing. Put the vinegar, olive oil and mustard in a mason jar with the lid on. Shake vigorously until all of the ingredients come together. Pour this dressing over your warm sprouts and toss. Transfer the dressed sprouts into a large salad bowl. 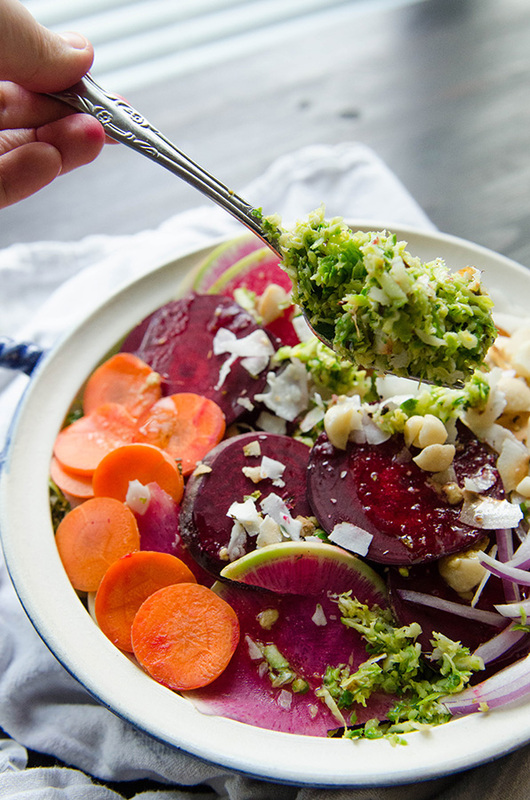 Layer the onions, carrots, beets, and watermelon radish on top of the dressed sprouts. Top the whole thing with toasted coconut chips (you can either buy them toasted, or simply toast them up in a pan over the stove. Just watch them and toss them frequently so that they don't burn) and the chopped macadamia nuts. Serve and enjoy! This is lunch today. Thank you for the recipe! Thank you! Looks delicious. How many servings does it yield? It depends on if you’re chowing down on it as a side dish or as a full meal. I would say 2 as a full meal, and 4 as a side. But, it depends on your hunger level. I wasn’t able to read the response to the serving side. As a meal, how many would this recipe serve? Should the beets be roasted? My husband and I loved it! Thanks! This was absolutely divine- earthy, mildly sweet and peppery yet umptuously flavored with the addition of the coconut and macadamia nuts. Flavor explosion is all I have to say. Will be making again and again.